I have several ways I usually prepare potatoes: mashed, baked, fried, in latkes, in potato salad, Potatoes Anna, scalloped potatoes, the usual American fare. So when Frieda’s Specialty Produce Company contacted me and offered to send me some little potatoes, I decided I wanted to do something different with them, that I had never done before. Time to get creative. A couple of days later, the FedEx man was knocking on the door and my babies had arrived. Frieda’s had sent me two different varieties. 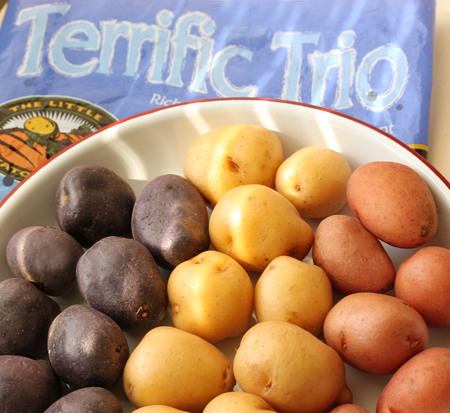 One package was called Terrific Trio, which contained yellow, red skin and blue baby potatoes. The other package was called Piccolo, which were teeny yellow potatoes, none larger than 1¼ inch. They were so cute! I thought I would start with the Terrific Trio, because I had never seen a blue potato and I wanted to see if it was also blue inside. These are grown by The Little Potato Company, which is based in Canada, and they harvest their potatoes in Nebraska and Washington. LPC is a small, family business, with a woman CEO, Angela Santiago. Their potatoes are not runts or rejects, but are a special small potato variety. And guess what? You can find them at Ralph’s Stores throughout Southern California! You can rush right out and get some, and make this terrific recipe! Since these potatoes are little, they are perfect for appetizers, which is what got me thinking about how I could create a one-bite item. 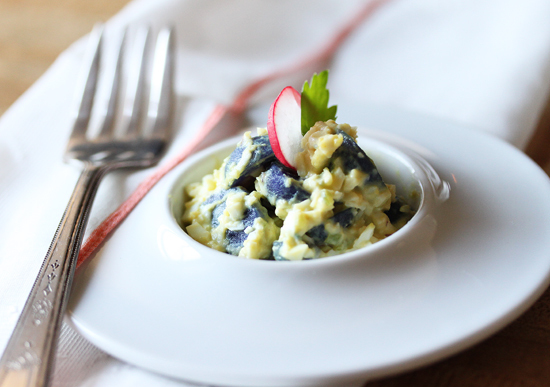 Initially I was going to make potato salad, but when I cut open those blue babies and saw the amazing color, I decided to make a deconstructed version, putting the egg-y salad part in the potato, instead of the potato in the salad. So that’s what I did. The contrast between the brilliant color of the potato and the yellow egg salad with the radish haystack on top looked so happy to me. These are one bite, maybe two, and would look great on your buffet table or passed hors d’oeuvres. Did you know that Frieda’s Inc. is celebrating its 50th birthday? It is a woman-owned family business that was founded in 1962 by Frieda Caplan, who is an icon in the produce industry as the first woman to own a produce company in the United States. Her mission of changing the way America eats fruits and vegetables is credited with introducing such table-staples as Kiwifruit, Brown Mushrooms, Spaghetti Squash, Shallots, Donut Peaches and a wide variety of Latin and Asian Specialties. They are based in Los Alamitos, California, where Frieda serves as Chairman of the Board, and her daughters are President and CEO. Thank you Frieda’s for sending me these great little Baby Potatoes! So you may be wondering about the Blue Baby Potato Salad in the top photo. After I filled enough potatoes to photograph, I still had some of the egg salad mixture left over. 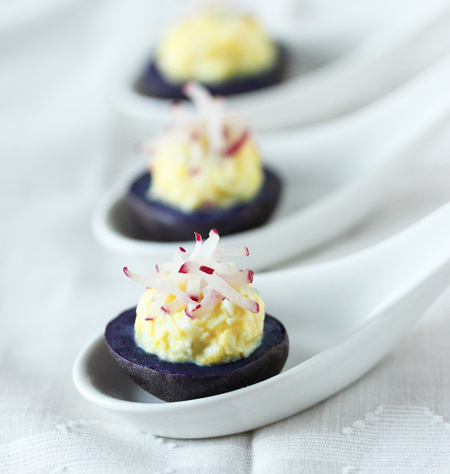 I also had all of the little scooped out blue potato rounds made with my melon baller. I didn’t want to throw them away, so I folded them into the egg mixture. It was so pretty I had to shoot it and that’s where that photo comes from. I think I will use these in a potato salad in the future. They are pre-washed; thin skin, so no peeling; microwave in five minutes and they’re at Ralph’s! What could be better? 1. Fill a large sauce pan with enough water to cover potatoes. Add two teaspoons salt. Bring to a boil, add potatoes and when water returns to a boil, start timer for 15 minutes. Test biggest potato with the point of a sharp knife for doneness. 2. When potatoes are done, drain and cover them with cold water. When cool enough to handle, remove to paper towels to drain and dry. Set aside. 3. Fill a sauce pan with enough water to cover eggs. Place eggs in cold water and bring water to a boil. When water begins to boil, turn off heat and let eggs sit in hot water for 10 minutes. 4. Drain water from pan and cover eggs with cold water. Peel when cooled. 5. Cut eggs in half and place cooked yolks in a medium bowl. Mash yolk thoroughly with a spoon, then add mayonnaise and mustard. Add salt and pepper to taste. 6. Mince the egg white very small and add it to the yolk mixture along with the minced celery and onion. Mix well to incorporate. 7. 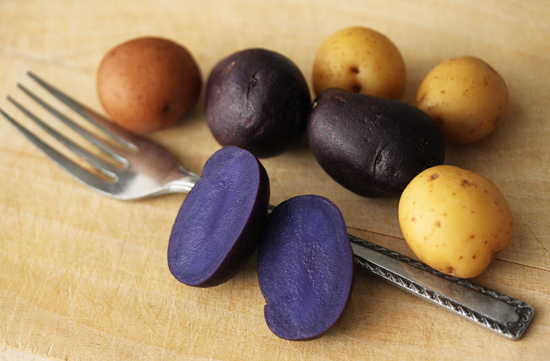 Cut the baby potatoes in half length-wise with a sharp paring knife, being careful not to tear the skin. 9. Fill the potato with the egg salad mixture, mounding it about ¾-inch high. I used a spoon and pushed the egg mixture off of it with my finger. If mixture flattens, pinch it back into the dome shape with your fingers. 10. Garnish with a stack of radish batons. Note: If you don’t have radishes, you could garnish with basil chiffonade, a parsley leaf, a triangle of red pepper, an olive slice. Use your imagination. Light The Skies Philadelphia!!!!! « Holiday « Events by Katrina Gilbert – Philadelphia Wedding and Special Event Production and Planning . Those purple potatoes are so pretty, love your bite sized potato salad! Thank you Radish Rose for your lovely comment! Found your website through Grace-Marie’s cooking school. I’ve been going to cooking classes with my group of friends for years now. 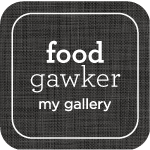 As I look at your beautiful website there are so many of your recipes that I’d like to try like those fabulous blue potato appetizers. After I’ve tried your recipes I’ll let you know how they come out. Hope to see you at one of Grace’s classes. Thanks for the great job of making everything look so incredibly delicious! First time here and I love it! I love finding those little purple potatoes. You’re idea of a deviled potato is a fantastic idea! I’ll definitely going to try it! 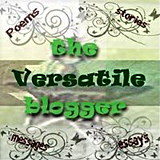 Love your photography and your website! 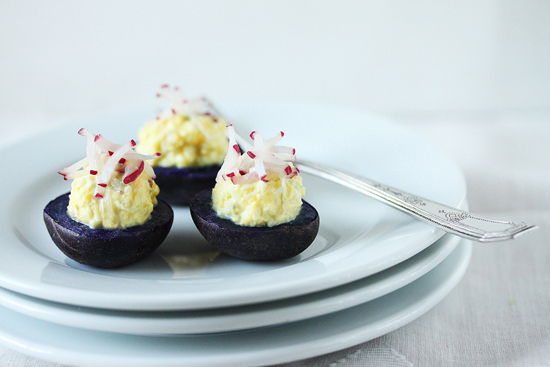 I love the colors on this… the dark potato and the egg salad on top. So lovely and modern for the next Easter.